Both series lived on in reruns throughout the 1970s and later made the jump to the big screen, although Star Trek had MUCH more success at the box office. Both franchises enjoyed comic book runs, merchandising, fan clubs, and saw many of their cast members appearing often at conventions. And while no one would argue that Star Trek is well in the lead over Lost in Space in nearly every category of success imaginable, I now find myself looking forward much more to the second season of the new LiS than to the second season of Discovery. So what did LiS do that Discovery didn’t? The answer to that question has many facets. First, of course, is the fact that LiS is a complete reboot, a totally new reality. 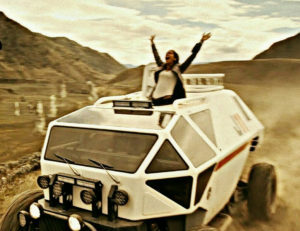 Although the character names and relationships are still the same (mom, dad, three kids…plus Dr. Smith and the Robot), the original destination is still Alpha Centauri, and there’s still a Jupiter 2 spacecraft and a “Chariot” land rover (both of which are totally awesome designs, by the way) —here come the SPOILERS!! !—this time the Jupiter 2 is just one of many landing craft that flee the colony ship Resolute after it is attacked by that very same Robot (this time an alien-built machine). Other colonists have also survived to reach the surface, which allows for a much more diverse and expansive cast. Discovery also went in ways that were noticeably different that its predecessors—notably the new look of the Klingons, unusual Starfleet uniforms, and technology that mostly doesn’t match what came before in televised Star Trek. But instead of “starting over” in a new reality or timeline (like the J.J. Abrams reboot films did) Discovery’s writers and producers hold firmly to their assertion that this is all happening in the “Prime” Star Trek timeline, and that in another ten years, the starship Enterprise, the uniforms, the Klingons…everything will look just as it did during those original 79 episodes of TOS. Is that why I like LiS more than Discovery…because LiS did a clean reboot and isn’t pretending to be something it’s not? Perhaps a little, but no, that’s not my main issue. 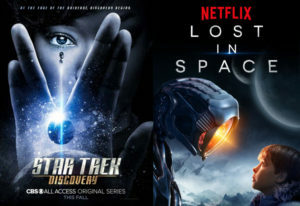 Am I angry because I have to pay a separate $6/month to watch Discovery on CBS All Access, while I’m already paying for Netflix and can just watch LiS there along with so many other great sci-fi programs (Stranger Things, anyone)? Again, a little. I would definitely have preferred that the new Star Trek have simply been licensed to and produced by Netflix—as Marvel is doing with their Defenders superhero shows—rather than used to prop up an otherwise anemic line-up on All Access. But again, not the main problem. Here’s my BIG problem: Discovery has never made me stand up and cheer. Discovery hasn’t put me on the edge of my seat. The new Lost in Space has done just that…several times, in fact! And we did. And we cheered again. We’d actually cheered a few other times during some earlier episodes, too. The danger (Will Robinson! ), the suspense—from the writers to the actors to the directors and producers—everyone pulls it off amazingly well. This is a show about human beings surviving everything a hostile planet can throw at them—through strength, through intelligence, through bravery, through perseverance and faith, both individually and together…overcoming not just challenging circumstances but also self-doubt and weakness. This is a show about what it means to be human (and it doesn’t need any long-winded speeches to do that). I can honestly say that, were the USS Discovery to suddenly disappear into a black hole, I wouldn’t really miss anyone on the crew (no, not even Tilly). The one guy I even cared about a little had his neck snapped by a Klingon sleeper agent. So no, I’m not really emotionally invested in any of those characters. I wouldn’t want to be friends with them or even serve on the same starship as that crew. Gimme Kirk and company, Picard and company, Sisko and company, Archer and company (well, mostly)…heck, even strand me in the Delta Quadrant with Janeway and company. Just don’t assign me to Discovery! Granted, it’s not like everyone on the Jupiter 2 is perfect either! I think the writers pretty much fumbled the ball with the character of Don West, who is a great pilot but is also smuggling contraband to Alpha Centauri. Think Han Solo but less charming. Dr. Smith is a mentally unstable, borderline-psychopathic, potential murderer. I totally hate her. On the other hand, I think I’m supposed to. I’m probably supposed to hate the Mirror Universe Empress Georgiou, as well, but that character just makes me yawn. I feel neither love nor hate nor anything for her…and that, my friends, is my main problem with Star Trek: Discovery. Dr. Smith versus Emperor Georgiou…who would win? I’m so much more terrified of Dr. Smith! Tomorrow in Part 2, I dive a little deeper in the specifics. What I’ve said so far was mostly generalities, but those only get me so far. If I’m really going to justify why I enjoy Lost in Space so much more than Star Trek: Discovery, I’m going to need to provide some more concrete details about what LiS is doing that Discovery isn’t. And I shall! 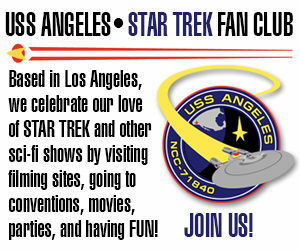 Thank you for asking that big questions about cbs and there so called star trek new tv network on the webpage. They will not tell no one. But you should put it out to all of the news paper to ask this big question about the new star trek show about if they like it or not when they will need to pay out $9.000.000.00+ for the new show?. Actually, Star Trek Discovery’s first season cost $120 million, not $9 million, Ken. Netflix licensing covered about $60-80 million of that. This is pretty much the same reaction I had to the LIS reboot. The first couple of episodes are “wobbly”, but the show finds its groove from Episode 3 onwards, and once it settles in, it’s quite watchable. The characters make all the difference, as you said. The wonky abuses of, say, ice-physics, are forgivable and forgettable once we actually care about the characters, and LIS stomps STD flat in that category. I’d definitely watch a second season of LIS, but all the ham-fisted stuntcasting in the world can’t save STD from circling the bowl. Star Trek Fans are the Primary reason why Trek doesn’t get better and really gets worse. The original creators of Trek were inspired by the future. The current creators are inspired by profit. The Trek fans do little to discourage this. They as a whole frequently consume anything they are offered with no discerning taste. If Trek Fans were like Star Wars Fans the creators would give us what we want at the threat of enforcement of the vote by wallet. When Solo came out it bombed because of Last Jedi. That’s not how Trek Fans behave. Trekkies are frequently perpetually blind to the lack of quality in their franchise. I’m not so sure about that. Star Trek V didn’t do so well. Weakest of all the original movies and almost derailed Star Trek VI. Clever.. that’s what LiS is doing.. “cleverer” things. Discovery is just phoneying it in. I’ll give this show a try after reading this! The original was so silly I did not want to watch this one. Already watched episode one! They’re in real danger. I’m hooked! Thanks Jonathan, i’ll have to check it out now. I had seen trailers, was intrigued, but put it on the back burner. I’ve been a little “Lost in Space” myself these past couple months, “CyberSpace” that is. WHY do we always have to compare every show and claim one is better than the other? I like Orville, I like Lost in Space, I like Discovery…I need to watch the Expance. Why is there. Always the need to compare one to the other and say it is BETTER? Different shows are different and instead of fighting over the differences why can’t we just accept them for what they are? 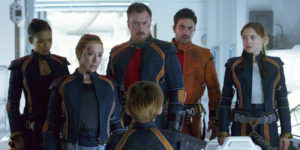 (Sounds like a familiar Star Trek ideal) Lost in Space is more of a kid’s show than Discovery and we all knew that from the beginning, so why is there a need to argue about it and call for changes to make one more like the other? If what you personally see from one show to the next makes you dislike that particular show, why is it necessary to harp on it and cry for changes? I assure you that things you do not care for are theroughly enjoyed by other people. I think Jonathan that this is why I pop up now and then because I always see the unfavorable comparisons and feel the need to present my own personal opinion. Maybe if people just would try to understand other prople’s Opinions instead of acting like their opinions are the only ones that are correct maybe we could all get along better. Maybe. Ps. I keep saving my name and email on here and for some reason it always forgets me. Please don’t lecture me about internet protocol, the problem isn’t on my end. I didn’t agreee and respectfully stated my opinions. It’s funny how you chose to answer something (how many people read your blog…I do!) and ignore everything else I said.